My DH had a really nice birthday. He had requested a Candy Cane pie, so I picked one of those up first thing in the morning. I gave him my replacement iPod from the replacement I got after my iPod bit the dust at Thanksgiving (it seems so long ago - LOL). He's really looking forward to dumping some CD's onto it, so I'll set up an iTunes account for him and teach him how to use his iPod on Sunday. It's always a chore to teach him how to use new features, but I think he really wants to do this so it might work - LOL. 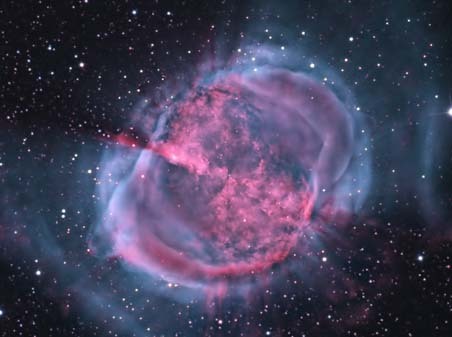 This is M27, also called the Dumbbell Nebula. Take a look at it. It's beautiful, isn't it? This, by best estimates, is what our own Sun will look like after it explodes expands in the future. We'll contribute to the beauty of the universe. Personally, I think that's simply marvelous. So I'm sharing my joy with all of you today. Have a phenomenal day today! I think eventually he'll find it easy to use. I just hope that having earphones will allow him to hear music again. He's missed it a lot since his hearing got so bad. Good luck with the ipod lessons! I keep trying to help my mum with her ipod and usually end up wanting to bang my head against the wall! I do indeed get the difference. I must have misinterpreted "...the type of nebula our Sun will produce when nuclear fusion stops in its core..." which is what the Astronomy Picture of the Day captioned the photo. My bad :-( Thanks for the clarification. I haven't heard of a Candy Cane pie. Sounds yummy! ... Candy Cane pie? Ooh. This is not something I've heard of before, but it sounds delicious. It's a seasonal specialty of Baker's Square pie shop, a national chain I think, and it is one of my favorites, something that always gets me into the spirit of the season. Look at you! You're famous! What is Candy Cane pie? My mental image is a bit 'sing a song of sixpence' at the minute! Well, it's http://www.bakerssquare.com/pies/ the featured pie. It's minty for the actual body of the pie, with peppermint pieces sprinkled on top and an oreo cookie crust. It's awesome!